This system works with an app which you download for free. Take a photo or photos of what is in the box then pack it. Then scan the label. 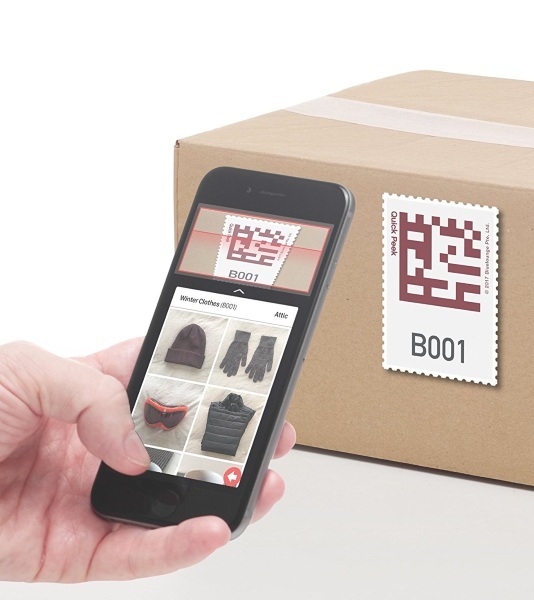 It will attach the photo to the label you scanned, in the app, and that way, the next time you are looking for things, just scan the labels, no need to unpack anything. This is a brilliant solution for people who have to keep many things in storage like art supplies or winter clothes. This way you don’t have to make a mess of things when you just need that one jacket or a single color of yarn. Packs comes sets of 32 or 100. Downside is, it’s iPhone only. Prices start at $9.95.